Johannesburg - Wherever she goes, Nonhle Mbuthuma expects to feel the cold metal tip of a gun pressed against her head. The land and environmental rights campaigner knows she could pay the ultimate price in her unwavering fight to protect her unspoilt, ancestral land from mining. “I don’t feel safe at all,” says Mbuthuma, a founder of the Amadiba Crisis Committee (ACC), of the threats she receives from pro-mining interests. 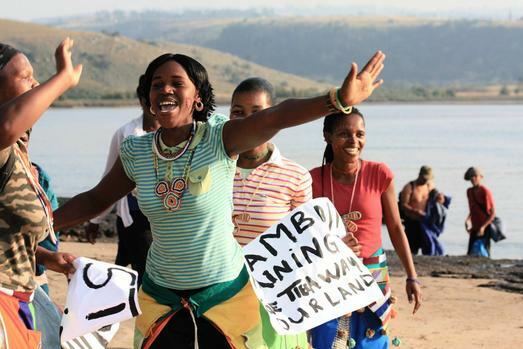 Since 2007, Mbuthuma has helped lead the long-standing resistance of the coastal villagers of Xolobeni, a cluster of villages nestled in the dramatic, rugged cliffs of northern Pondoland on the scenic Wild Coast, against titanium mining on the coastal dunes. Her desire to safeguard the land, she says, runs in her bloodline: her grandfather was a leader of the Pondo Revolt that successfully fought apartheid dispossession over half a century ago. “Our community is so unique. That’s because our people have land and can feed and sustain themselves. In many parts of South Africa, you can’t find this way of life any longer because people are dependent on the state. In November, Xolobeni residents clinched a landmark victory against the Department of Mineral Resources (DMR) and Transworld Energy and Mineral Resources, a subsidiary of Australian miner Mineral Commodities (MRC) when the North Gauteng High Court ruled that in terms of the Interim Protection of Informal Land Rights Act (IPILRA), the minister of mineral resources may not grant mining rights without the full consent of customary communities. Mining rights were awarded in Xolebeni in 2008, but Susan Shabangu, the former mineral resources minister revoked them three years later as several environmental issues were outstanding. The firm was awarded a mining right in 2015 to scour 22km of dune sand, rich in titanium, but in 2016, former minerals resources minister Mosebenzi Zwane enacted an 18-month moratorium on the Xolobeni mining application following the alleged assassination in March that year of anti-mining activist Sikhosiphi “Bazooka” Rhadebe, chairperson of the ACC. No suspects have been brought to book and the firm has strongly denied any link to violence. Her colleague’s murder sent Mbuthuma into hiding and she has to use a bodyguard. “I’ve been told my name is on a hit list. Things are getting worse. I’m waiting for something to happen to me... We will fight for this land. It’s part of our identity,” she says, resolutely. MRC says the historic Right to Say No judgment is in conflict with the current Mineral and Petroleum Resources Development Act (MPRDA), “which provides for consultation, not consent, that is vested in the competent authority”. “The company continues to believe that the Xolobeni project has compelling socio and economic benefits for the area and can be developed in conjunction with the eco-tourism and agricultural initiatives that are being put forward by various stakeholders,” it says. It has maintained it has large scale support for its project that will bring benefits to the “poorest of the poor”. Last month, Minerals Resources Minister Gwede Mantashe announced the imminent commencement of an independent survey to be undertaken in Xolobeni, which would entail “thorough consultation”. But the ACC, represented by Richard Spoor Attorneys and the Legal Resources Centre, has termed the survey a “stunt” that has no basis in law. This week, Mantashe reportedly told delegates at the Mining Indaba that he believed that giving communities the right to decide whether mining may take place on their land would create “chaos”. His department has applied for leave to appeal against the judgment, noting that “the learned judge erred in finding that the applicants, as a community whose tenure was insecure due to the legacies of the past, now enjoy elevated protection, different from common law owners of the land”. The judgment, the ACC points out, ruled that mining companies must comply with the Interim Protection of Informal Land Rights Act (IPILRA) before they can have mining rights under the MPRDA. “It’s a great pity and irony that rural people who fought to protect their land from the apartheid government have to fight their democratic government,” says conservationist Sinegugu Zukulu, who has helped champion the fight against titanium mining and the controversial proposed N2 toll road. The communities of the Wild Coast must reap the eco-tourism benefits of keeping the region pristine, Zikulu maintains. His colleague, Margie Pretorius, at non-profit Sustaining the Wild Coast, agrees. She emphasises that the choice of the residents of Xolobeni to seek economic development through the growth of tourism and agriculture instead of mining must be respected. “It seems he (Mantashe) really does not understand the unique nature of the Xolobeni area as a place where cultural heritage, agricultural endeavour, archaeological significance, botanic diversity and remarkable beauty combine to make the Northern Pondoland coastal area a very special place in South Africa. “For Mantashe to suggest that coastal dune mining can coexist with the kind of tourism that makes the area attractive to tourists is absurd, and his comparing of Xolobeni to Richards Bay as a place where this has happened is not helpful. “Xolobeni is not Richard’s Bay and the people who live there do not want it to be industrialised in the way that Richards Bay has been. “Xolobeni, home to areas of critical biodiversity, particular beauty and tourism potential should be declared a no go area for mining. John Clarke, a social worker, sees the “irrationality” of mining over tourism and agriculture. For the past five years, Clarke has sought a case study from anywhere in the world that shows an equivalent rural community like the Amadiba ending up “being better off collectively” in terms of overall quality of life after they have been resettled to make way for an opencast mining operation, such as is envisaged on the Pondoland Wild Coast. “The question is what will happen after the dunes are mined out. Can eco-tourism fill the economic void? Will agricultural productivity be restored? There are very high biodiversity values and substantial ecological capital on the Wild Coast, so it is a no brainer that eco-tourism would be a much more ‘justifiable’ and lucrative money spinner for an indefinite term far into the future.